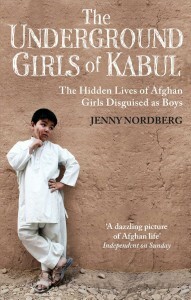 Jenny Nordberg, winner of the Robert F. Kennedy Award for Excellence in Journalism and a former correspondent for The New York Times, has not been in Afghanistan for long when she realizes that the son of Azita, one of the very few congresswomen in the country is, in fact, a girl. As she meets with officials and expats trying to make sense of how a country where girls mainly stay indoors after puberty and need to cover their heads from a very early age would allow cross-dressing, she unveils an extraordinary finding: the Bacha Posh. The Underground Girls of Kabul is a walk through the lives of many Afghan families who have a bacha posh, or a daughter posing as the family’s son. The bacha posh do this in order to be “the pride of the family” and to accompany their mothers and sisters on their few outings beyond the walls of the home. Being a bacha posh is, for little girls, the opportunity to run free outside, to climb trees, to not wear a headscarf, to play soccer and to ride bikes. Being a bacha posh is a chance to go to school and get an education. It is also a chance to sit in the front seat of the car or at the table by their father and to be heard when they speak. But it is also more than that, and even simpler: Being a bacha posh is no more and no less than to be acknowledged and to exist, which for many girls in today’s Afghanistan does not happen. Bacha posh are normally chosen at birth by parents who are lacking sons. Some bacha posh choose their own destiny, asking to dress as a boy. Although there are a few exceptions, these girls-as-boys normally transition back to being women before reaching puberty. Of course this might have consequences for the children as they become adults, which many of them, who now live as women after “being” boys for most of their lives, accept. But none of the people the author talks with regret being a bacha posh. Instead, the experience stays in their minds as the time they were free, seen and heard. Nordberg’s volume is a graduate-level terminology class on what it means to be a man or a woman, on concepts of manhood and womanhood, on gender and adopted gender and human rights. The book digs into the gender-specific behaviors associated with men and women, our roles as one or the other, and how much of our lives revolve around the idea of gender differences. Such notions of difference have evolved to lessen women’s rights in places like Afghanistan and justified women’s lack of education. And while words like “empowerment” and “awareness” resound in workshops and seminars held by international organizations in Afghanistan, the reality of the bacha posh has existed for as long as history remembers.